I’ve got a question, did a search (video music) here and did not see it addressed. Posted in the video section w/o response. Trying my luck here. Does including references to purchased licensed music included in recreational videos (those not for profit) enable posting that video without it being taken down or causing trouble on FB or Youtube? So many of y’all produce hunting vids that someone has to have a solid answer. With all of the viral lip-sync videos that include popular music I’m a little confused how this is handled. Without a license specifically allowing use of the music, it will still be taken down if a DMCA request is sent by the license holder. Additionally video hosts such as Youtube have software in place to detect the use of copyrighted material and automatically remove the offending videos. Though not all uses are detected. No, it really doesn’t help. It’s a gamble using licensed music in your video. If uploaded through YouTube they can pull your video at anytime. 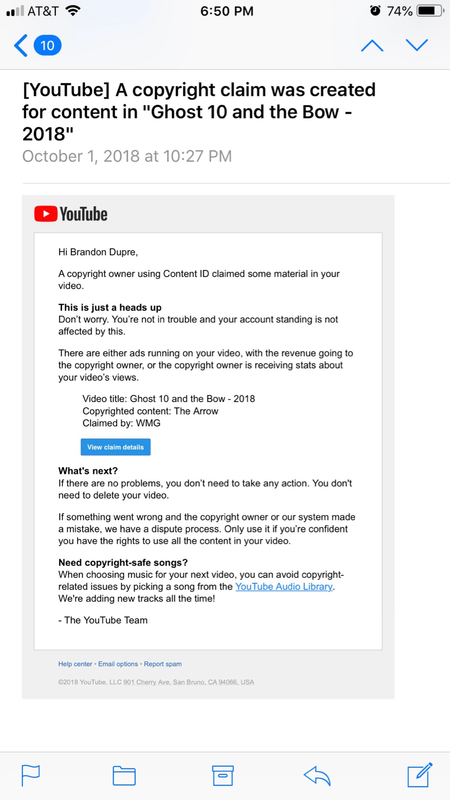 Here’s the email I got last month on my buck this year when I uploaded my video to YouTube. Thanks fir the feedback y’all and posting that email too. The video in question is a Scout Summer Trek. I've recently used mp3s from significant artists and had nothing show up about it (AC/DC). However, I'll try to use royalty free music if I can. I use a couple of different sites and artists. Some artists like Kevin Macleod let you use their work with attribution. I mainly use Jamendo.com for my videos. You buy the music for your specific purpose but it is a very reasonable fee. Even with purchasing I commonly have to go through the dispute process by sending YouTube my license information. Have had no issues since I started purchasing licenses. Before I started purchasing I would chance it using songs I liked from iTunes. That bit me when I had to totally rework the entire soundtrack to my Hagerman video. That broke me. Last edited by Booner Sooner; 11-08-2018 at 10:39 PM. Yes Thank You, the resources mentioned are helpful.